If you are reading this, there’s a good chance that you love cats; and you probably want your cat(s) to be happy, healthy and with you for as long as possible. How do we do this? What makes a great home for a cat? Obviously, we want to keep them safe and free from harm; but what might this entail? Interestingly, there are differences of thought around what responsible cat “ownership” entails in different parts of the world. In North America, for example, over 50% of urban cats are housed indoors, while in the UK the majority of cats are allowed outside. In both cases, caregivers believe fervently that they are being responsible“pet owners” by keeping them inside or by letting them out. Let’s look at the pros and cons, and, if you choose to keep your cat indoors, how to optimize their wellbeing. 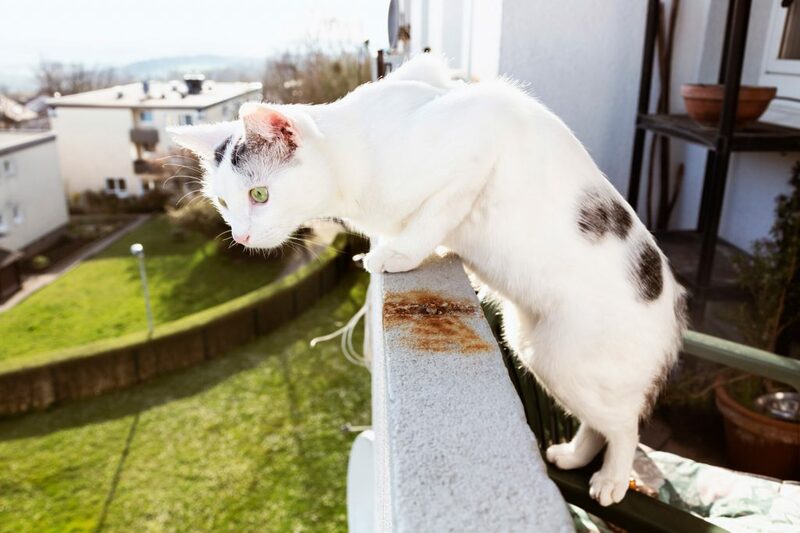 The decision to keep a cat indoors may be practical: living on the 21st floor of an apartment building in a busy city prevents ready access to the outside. Other people may choose to keep their cats indoors to protect wildlife. A common reason for restricting or preventing outdoor access is to reduce hazardous encounters with cars and the accompanying fear of this for their owners. Cats are less likely to get lost, fight with other animals becoming wounded, getting an abscess or being exposed to some infectious diseases. Being indoors prevents risk of exposure to poisons found outside (e.g., rodenticides, pesticides, plants) and your cat can’t eat food you don’t want them to. People (mistakenly) believe that indoor cats are not going to get internal or external parasites (e.g., fleas, worms). Finally, an un-spayed cat won’t be at risk of unwanted pregnancy. What Are The Effects Of Indoor Living On Cats? Are there any downsides to keeping cats strictly indoors? Are indoor cats still “at risk”? There is a degree of reality-perception mismatch if owners think that their indoor cat’s life is free from perils. 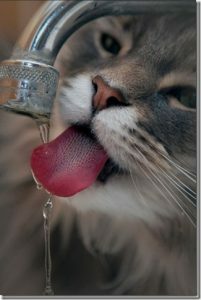 While the vast majority of cats kept indoors for purposes of safety will have adequate food and water, and illnesses addressed when noticed, many do not have the ability to express normal cat behaviours. This may result in distress, fear, undesirable behaviours, and potentially illness. Interestingly, studies comparing mortality of cats housed indoors with those allowed outside are not available in the North American veterinary literature. Although predators and vehicles have been taken out of play, there are different hazards for the indoor cat. These include falls from balconies and windows, kitchen scalds or burns, access to toxic cleaning products, plants, and unsuitable food (e.g., onion, garlic). Cats have not been selectively bred to be indoors 24 hours a day and many do not adjust to living in close contact with people. For this adaptation to be successful, a cat used to outdoor access must have had complete and successful socialization to people prior to seven weeks of age. Additionally, because cats inherit fearful traits, some cats will be inherently unsuited to close human contact. 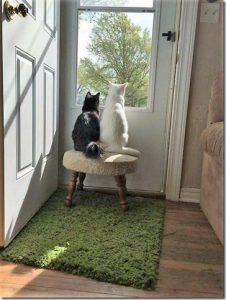 Similar concerns exist when trying to integrate cats from different sources: social living requires early socialization and cats have different personalities (sociable, timid and unfriendly, active and aggressive). A monotonous and overly predictable environment is stressful. Cats may be restricted from performing behaviours that express their natural cat-like nature. 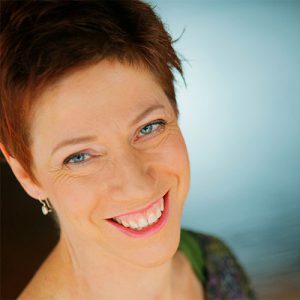 Psychological and physiological stress may follow that may result in either problem behaviours – natural behaviours that are unwelcome in the home, e.g. spraying or scratching, behaviour problems (e.g. obsessive grooming), or physical illness. Signs of stress and anxiety may be obvious (such as changes in appetite, grooming, increased vocalization, hiding, vigilance, aggression, spraying or compulsive behaviours), or subtle (such as decreased activity, play, inquisitiveness, and fewer positive interactions with people and other animals). Physical illnesses that are more prevalent in indoor cats include lower urinary tract (LUT) diseases (crystals, idiopathic, sterile cystitis), obesity, hyperthyroidism, odontoclastic resorptive lesions, and diabetes. While indoor-only cats may be more closely observed and changes in behaviours more readily noticed and they may receive more frequent veterinary screening to identify hyperthyroidism or dental lesions compared to free roaming cats, many cats with outdoor access are diagnosed with these conditions, thus presumably receiving similar levels of attention. Who Is A Cat And What Do They Need? Socially, cats may live on their own or in groups that consist of related females and their offspring. In our homes, cats usually are unrelated. A cat’s territory is based around essential resources, most prominently food. Both males and females mark their territories with olfactory clues: spraying urine and scratching vertical surfaces (which provides both olfactory and visual signals). Resources areas may be time-shared so cats avoid confrontation by avoiding contact. Designed to be solitary survivors, cats prefer to avoid fighting: they cannot risk injury. Fighting is a last resort and occurs when escape is impossible. Cats want privacy for hiding, safety, observation, undisturbed rest, and sleep. These areas may be on the ground or elevated. 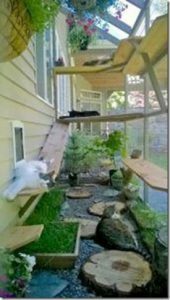 Vantage positions allow cats to avoid or evade intruders, predators and other threats. What are typical cat behaviours? These include play, investigation, observation, hunting, feeding, drinking, grooming, scratching, travelling, scent marking, eliminating, resting and sleeping. Most cats sleep for about 10 hours, rest and nap for 5 hours, hunt for 4 hours, groom for 4 hours, eat for about 30 minutes and travel (outside of hunting movement) for about 1 hour. They are busy creatures! A charming (and annoying) aspect is their crepuscular (resembling twilight) activity pattern. They are naturally more active at night, especially at dusk and dawn. This coincides with the best times to hunt. What do cats need? Here are five pillars for a healthy feline environment. A safe space is one in which a cat can rest, relax and sleep in without fear. Cats also need to be able to observe from this, or other, vantage point, hence the space is often raised. A dip in a perch or shelf allows the cat to remain concealed and have a sense of control. 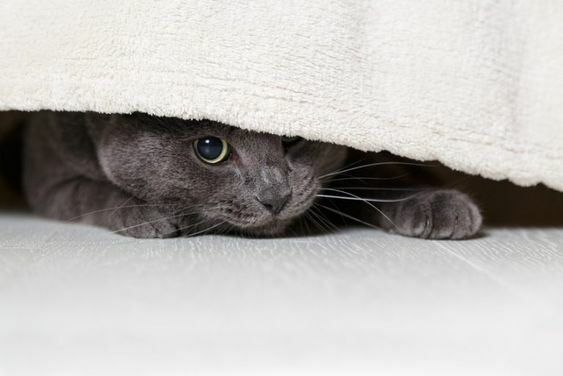 Hiding is an essential coping behaviour for cats: not having the ability to hide can contribute to stress and illness. In a household with more than one cat or with a dog or a person that might invade the cat’s safe space, it is essential that the cat cannot feel trapped. The safe space must have more than one entry/exit. Multiple safe places need to be separated from each other and there should be at least one safe space per cat in the household. Placement may depend on physical restrictions for an individual, e.g., a cat with limited mobility needs a ramp to the space or spaces that are lower and easy to get into (no high edges). Given that territory is based on resource availability, cats must have access to all key resources without running risk of harm. While socially gregarious, cats hunt and eat alone. Separation of resources reduces competition and chance of ambush. Basic resources are food, water, toileting areas (litter trays), scratching, playing and, observing, resting, sleeping areas. Each resource is located in a separate area from the others rather than in “their own room” . Additionally, cats should have a choice for each resource: two or more feeding areas, water bowls, litter trays, etc. Litter trays must be large (at least 1.5 times the length of the cat), numerous (one or more per cat) and clean. Individual cats may have different preferences for type and depth of litter. In general, as soil and sand are the natural substrates for toileting, sand-like or fine clay litters are readily accepted by most cats. Litter boxes must be distributed throughout the home, just as other resources are. They must be scooped at least once a day (preferably more often) and should be emptied completely and washed once a week. Using covered litter trays in a multiple cat household may contribute to stress from real, or perceived, fear of ambush. Scratching surfaces must be stable. Heavy immobile posts covered in carpet or sisal, rush or rattan matting, corrugated cardboard surfaces on the ground or affixed to the wall are suitable options. Drinking stations may consist of a variety of bowls, vases, and fountains or a dripping tap. Water should be fresh. Wide and flat bowls are preferable. 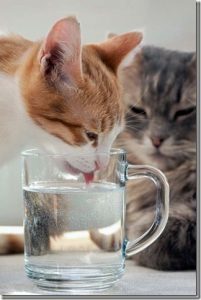 In situations where cats have bonded, they may share resources, however physical separation between different resources is still needed, (e.g., water is not beside food, etc. ), and every cat needs at least one feeding station. Cats are not successful with every hunt; they need to work in excess of the number of prey (10-20 small meals) required to meet their nutritional needs. Predation makes up a significant part of their day; their predatory drive is permanently engaged. In a household situation, this translates into pseudo-predatory play (toys) and eating many small meals. Unmet, cats are at risk of becoming bored or frustrated and obese. 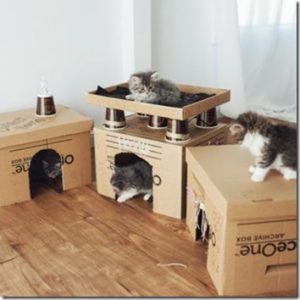 Make sure that there is sufficient space between cats when they play, (> 3 meters), or provide different play times. Exploration of novel objects, such as boxes or baskets also provides stimulation. 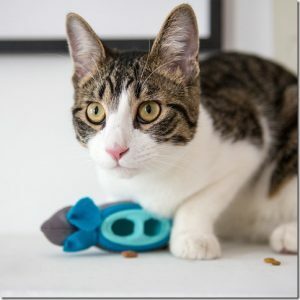 This website helps you choose the correct toy for an individual cat: https://indoorpet.osu.edu/cats/basicneeds/preypref. 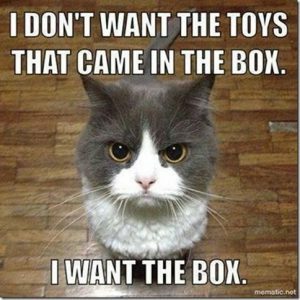 Allowing cats to hunt for their food by using a feeding toy provides mental stimulation and restricts calories. Scratching is an essential need, not just for sharpening claws and to shed the sheaths, but also for stretching and for depositing scent on vertical objects. Have multiple, secure desirable scratching surfaces in public areas (not “far from the action”). Nail trimming can be a low stress situation using positive, treat-based reinforcement. Nail caps may help protect furniture, but nails still need to be trimmed every four to six weeks. Visual stimulation is important for cats. At least one resting area should have safe, visual access of the outdoors (window ledge, climbing platform). Videos of birds, mice and squirrels provide visual as well as auditory stimulation and may be useful especially when there is no opportunity to see or hear the outdoors. Placing a ping pong ball in a bathtub for 30 minutes a day provides exercise, visual and auditory stimulation. Cat grass provides a textured gustatory stimulus that many cats enjoy. Rolling on a soft, textured mat (sprinkled with catnip) provides tactile stimulation. Cats use their sense of smell to perceive the world to a far greater degree than we do. In addition to odours, cats also detect and communicate through pheromones. Because our sense of smell is inferior to that of a cat, we may be unaware of the impact of the aromatic environment (deliberate and unrecognized) we provide. Deodorizers, air fresheners, disinfectants, detergents, cleaning products, perfumes, and scented cat litter may be pleasant for us but overwhelming or confusing for a cat. Smells brought in from the outside on shoes or those associated with a visitor may be threatening for the cat. Catnip, honeysuckle wood, valerian root, and silvervine are pleasurable olfactory stimulants. New items (e.g., furniture) being brought into the home should be exposed to the cat after rubbing the furniture with a cloth that has been in contact with the cat’s scent glands. These glands produce a variety of pheromones are located on the cheeks, in the forehead region, around the muzzle, on the tail and lower back, and from the pads. When a cat marks a surface or a corner with their cheek or by scratching, they are depositing their scent, making it familiar. These marks should not be washed off. 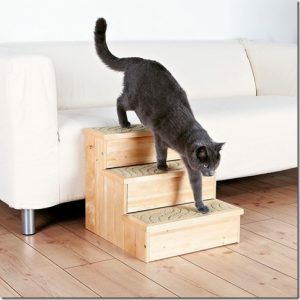 Providing sturdy scratching options (vertical or horizontal) throughout the home but especially at the entrance, helps to provide “safety” without the need to spray urine as a means of marking/defining territory. Synthetic pheromones that replicate parts of the cheek pheromone (such as Feliway), may be beneficial for a sense of security. And if your cat has to go to the veterinary surgery, send along worn clothing and bedding for familiar scents. Consistency and predictability are key to positive human-cat interactions. During the sensitive developmental period (age 2-7 weeks), cats should be exposed to at least four handlers and gently introduced to many, brief, positively reinforced experiences. Human attention is very important however cats often prefer more frequent, less intense interactions with people, than we might choose. In addition, cats like to choose the time and place of the social contact. After initially sniffing at the person, most cats prefer to be stroked around their head and neck rather than over their whole body. When a cat chooses to move away, one should not pursue contact. Of course, cats are individuals, and some prefer assertive, more forceful play, but when getting to know a cat, feline manners dictate petting only their head and cheeks. Fixed eye contact (staring) is very rude and is threatening to cats. Grooming is an important behaviour: this cares for their coat, controls parasites, and plays a social role. When a cat does not live with another cat to groom or be groomed by, you may need to help. As with stroking, unless a cat specifically solicits it, combing and brushing should be restricted to the head and neck areas. Unless cats have been socialized together, most cats do not get along readily in a multiple cat home. Think of it as your parents or the government showing up with a total stranger and telling you to welcome them into your home. Forever. 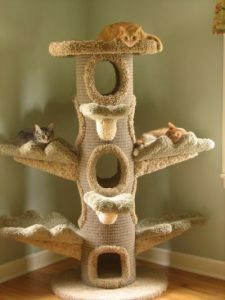 However, if they have been introduced properly (over several months) to the new cats, and if there is sufficient space with appropriate number of separated resources, cats may live well together. Wherever possible, safe alternatives to a strictly indoor lifestyle should be sought. 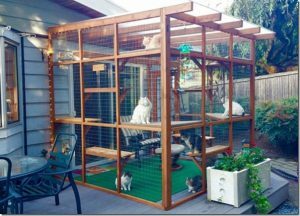 This can be achieved through secure yet stimulating, complex enclosures that cats cannot get out from nor other animals enter. There are numerous types of fencing one cat use and countless designs for “catios” on the internet. Finally, some cats are happy to walk on a harness and leash. Not unexpectedly, cats should be allowed to explore rather than being “walked”. When the environmental and social needs of cats are met, and adequate space and resources are provided, many cats will eventually adapt to indoor housing, especially if they have been exposed to this lifestyle from an early age, however cats used to outdoor access may find it difficult to make the adjustment as adults. The current state of knowledge does not answer the question whether strict indoor living is preferable to having outdoor access. There are risks and benefits associated with both options. Each case should be assessed individually and the wellbeing of the cat, the owner and the environment should be reassessed. "One small cat changes coming back to an empty house to coming home"